Prince's response to people who ask why he worries about animals in the face of widespread human suffering? "Compassion is an action word with no boundaries." Well, he's not a real prince, but animals might disagree! While we're sure that nothing can top winning PETA's coveted Sexiest Vegetarian Alive title (which he nabbed in 2006), pop royalty Prince is set to add yet another statuette to his mantelpiece: a lifetime achievement award from BET. In our opinion, Prince deserves a lifetime achievement award based on his empathy for animals alone. Refusing to eat "anything with parents," this cover boy for compassion recently served a sumptuous four-course vegan dinner to Ebony magazine staffers who were visiting his home to do a cover story on him. "If this jacket were real wool, it would have taken 7 lambs whose lives would have begun like this … Within weeks of their birth, their ears would have been hole-punched, their tails chopped off and the males would have been castrated while fully conscious. Xtremely high rates of mortality r considered normal: 20 2 40% of lambs die b4 the age of 8 weeks: 8 million mature sheep die every year from disease, xposure or neglect. Many people believe shearing helps animals who would otherwise b 2 hot. But in order 2 avoid losing any wool, ranchers shear sheep b4 they would naturally shed their winter coats, resulting in millions of sheep deaths from xposure 2 the cold." Years later, when a fan tried to give Prince a leather coat during a concert in Washington, D.C., he demurred, "Please do not kill a cow so I can wear a coat!" 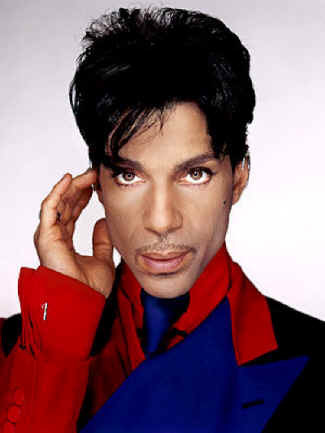 Prince also once famously declared: "We need an Animal Rights Day when all slaughterhouses shut down." His response to people who ask why he worries about animals in the face of widespread human suffering? "Compassion is an action word with no boundaries." Prince, congratulations on your richly deserved award.